A native Mac OS X webcam browser application. Is there a better alternative to SlothCam ? Is SlothCam really the best app in Network category? Will SlothCam work good on macOS 10.13.4? 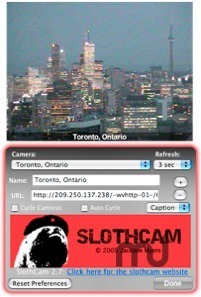 SlothCam is a OS-X native version of a popular OS X Dashboard widget and iOS application for viewing live webcams. This app is similar to the Dashboard widget version of SlothCam, except that, because this is a native Cocoa application, it can be run in full-screen mode and can synchronize with the iOS version of SlothCam via iCloud. This version of SlothCam gives you the ability to add and delete custom webcams, sync with the iOS version via iCloud, and save webcam images. In the future, I will try to add all of the features from the iOS and widget version of SlothCam. Now when SlothCam is in full-screen mode, it will behave more like the Widget version. It will now only update the webcam when the full screen app is visible, and otherwise it will stop updating the webcam image. In window mode it will continually update. SlothCam needs a review. Be the first to review this app and get the discussion started!